Went to his new home on Sunday 28th November 2016. 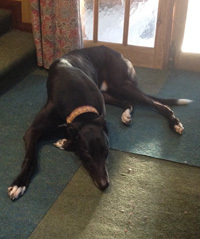 Ben is a black ex-racing greyhound who is a big gentle giant weighing about 37.5kg. He was born in January 2012, is neutered, house trained, inoculated and microchipped. He's a lovely dog who has a calm nature, enjoys being stroked and given attention, doesn't bother about other dogs, walks nicely on the lead and travels well in a car. 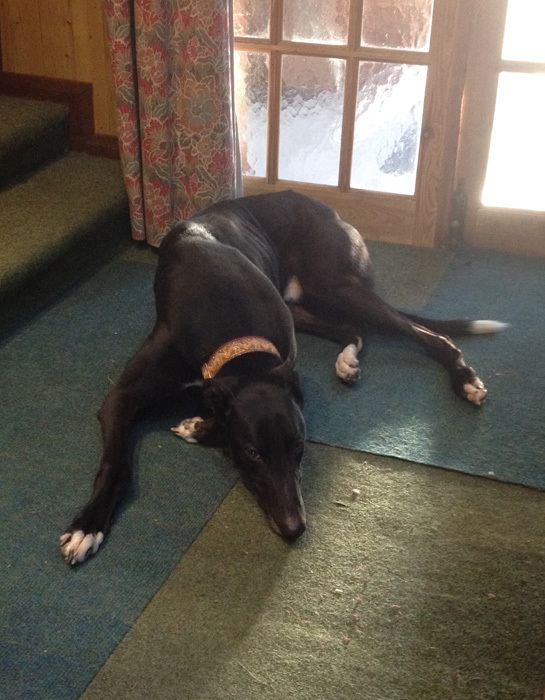 We heard today that:- " Ben is settling in nicely. His new bed came this morning and he loves it! Our two other dogs have accepted him into the house with no issues and he's happily toileted in the garden on his lead. He's still very quiet and getting used to the different sights and sounds. He's frightened of shadows, the curtain blinds, loud noises on the TV and the train which goes past the back garden. He's been out in the car today and gone for a walk, he was extremely well behaved and we've all fallen in love with him!!" We received an email today saying that:- "Ben saw the horses yesterday and was absolutely fine with them. He's had a good walk today in his new jacket, and he was very good but he hates turning round to come home. He just wants to keep going and when you turn to go back he puts the brakes on, he walks on eventually but I think he's a bit like Forest Gump, just wants to keep going. I need to find some loops and then he doesn't know we're going back! He's flat out in his bed now." We heard today that:- " Ben's doing really well, I'm getting wags from him now and he'll get out of his bed when I ask him to come over for a stroke." An email arrived today letting us know that:- "Ben's doing really well, we let him off in the field for the first time today and he had a play with a ball and a run around with Tango the terrier. He actually growled at her when she tried to get the ball out of his mouth and she left him alone which I found quite surprising, it's nice to see him standing up for himself. We are so happy we got him."